Maybe it’s been a long time since you’ve had to find love. Maybe it’s a fresh or unnerving concept for you to consider. We’re vulnerable creatures, we humans. We’re fragile, anxious, deeply passionate people who tend to forget that we are loved unconditionally already by Someone who will never let us down or break our hearts, though we spend plenty of time breaking His. This Christmas, let’s not be afraid to step outside of our comfortable loneliness to make a new friend. Let’s not try to read anything into and misinterpret the actions of others. Let’s love with all our hearts and souls and minds in the agape way of Christly love and show that we are overcomers. 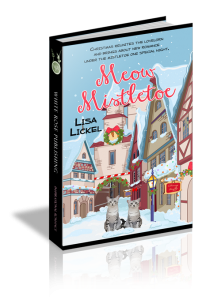 Meow Mistletoe—Holidays can be a time of delight, of recognizing and being bold enough to act on the possibility of romance. For lonely cat fanciers Ivy Preston and Adam Thompson, this Christmas is a promise. Brought together by their love and pride in their cat friends, purebred Egyptian Mau cats, Ivy and Adam circle each other, wondering at the enticing aromas of attraction and curiosity. Unfortunately, their cats prefer to take a good swipe at each other whenever they’re within range. If it’s a sign, Adam and Ivy aren’t certain how to read it. Opposites may attract, but for two people who’ve been wounded deeply, Ivy and Adam are leery of losing their hearts again. A holiday party seems the perfect place to learn more about each other. It’s not a date, and they don’t have to commit if their initial forays into learning about each other prove disappointing. But by night’s end, they figure out that peace and renewal can happen to anyone under the mistletoe.